BB: Who, among academics, would you like to see blogging who isn’t now? MG: One of the glories of the blogosphere is its surprise nature. You can be really pleasantly surprised by who turns out to be a great and interesting blogger. On the whole the bloggers are all from the margins still, younger scholars, independent scholars, graduate students. To take the country I know best, the UK, for example, I know of no blog belonging to anyone with a chair. In that scene, I’d love to see Richard Bauckham, Larry Hurtado, Philip Esler, Francis Watson, Maurice Casey, Christopher Rowland, Judith Lieu, Jimmy Dunn, John Barclay, and all the rest of the top brass blogging, but you and I know that that is never going to happen. So my basic answer is that I would like to see more of the top brass blogging, but I really doubt that it is going to happen. In the USA, I would have the same doubts about the top brass too. One recently retired, world famous NT scholar told me that he had never even knowingly visited a website. Many scholars, even now, have not even heard of blogs and blogging, and some who have have no idea that there are blogs in the Biblical Studies area. (Emphasis added). I love my certainty about something that turned out to be wrong. Not only does Larry Hurtado now have a well-loved and popular blog, but several others that I mentioned have also been involved with the blogs, including Richard Bauckham and Francis Watson. And here in the USA, I never would have imagined that Bart Ehrman would end up blogging, albeit behind a paywall. Now that we have some of the top brass blogging, it does make Jim's 2005 question worth asking again. Who would we like to see blogging who isn't now? BB: What do you see blogs becoming in the future? JD: In the short run, I think that blogs will become ever easier to use and more and more common. I hope many more of our colleagues in biblical studies and related fields will start blogs. The long run is harder to predict, because our technological base is improving exponentially and it’s hard to tell what new resources it’s going to offer us. In general, as I’ve said before in my SBL Forum article and again my recent SBL paper in Philadelphia, I think that blogging is “an early and primitive manifestation of what will become the ubiquitous media presence of the individual.” In other words, over the long term we will all become more and more connected together through the far more sophisticated offspring of what we now call the Internet, and our connections to it and to each other will be less and less obtrusive and more and more natural and taken for granted. Big Media (what bloggers call, often disparagingly, “mainstream media”) will still have an important place, but it will become more and more interactive. Two-way communication between it and individuals and groups — all of whom ultimately will occupy the same, um, medium — will make Big Media much more readily and swiftly self-correcting than it is today and will present us with a media continuum with Big Media at one end and the individual on the other and every imaginable permutation of group-size in between. I particularly love "I think that blogging is 'an early and primitive manifestation of what will become the ubiquitous media presence of the individual.'" I've been writing a paper, now with first draft completed, for the SBL International in July. It's advertised title is "Pods, Blogs, Websites and Mark," but I have retitled it as "Mark in a Digital Age: The Internet and the Teaching of Mark's Gospel". Research for it has involved going back and re-reading old blog posts, which is enormously good fun. I had forgotten, though, that the site biblioblogs.com, which used to be run by Brandon Wason, John Hobbins and Jim West, is now defunct and so was grateful to Mark Hoffman for drawing attention to the Wayback Machine Archive of the old site. Some of the formatting of the interviews has become a little mangled, but otherwise it's all there. I'm wondering whether we should archive this properly? I am happy to host it if someone else can be bothered to grab all the files. While reading my own interview from back then, I came across one hilarious failed prediction, which I'll comment on separately. There are thirteen videos in total. I have ordered them in Marcan verse order, with the exception of the SBL presentation featuring the Passion Narrative, which I have placed at the end. Because they are filmed on three different occasions, you'll see Boomershine's clothes changing between videos. I was delighted by the response to my post Blogging Mark - Input Requested Please. The comments there have very much helped me to think through my paper on Mark in the digital age for the SBL International coming up soon in St Andrews. For reflections on the history and development of blogs in this area, see especially James R. Davila, “Assimilated to the Blogosphere: Blogging Ancient Judaism,” SBL Forum , April 2005, http://sbl-site.org/Article.aspx?ArticleID=390; “Enter the Bibliobloggers,” University of St Andrews School of Divinity Website, November 2005, http://www.st-andrews.ac.uk/divinity/rt/otp/abstracts/enterthebibliobloggers/, and “What Just Happened: The rise of ‘biblioblogging’ in the first decade of the twenty-first century”, 2010 Annual Meeting of the Society of Biblical Literature in Atlanta, http://paleojudaica.blogspot.co.uk/2010_11_14_archive.html#1715486029034288246. See also Mark Goodacre, “Pods, blogs and other time-wasters,” NT Blog, 17 November 2011, http://ntweblog.blogspot.com/2011/11/pods-blogs-and-other-time-wasters.html. In other words, at this point, it's just Jim and me. What other nice round-up reflective posts on the biblioblogging phenomenon should I add? Thanks for your help. This is a great example of the communal internet and the joys of horizontal blogging! I have sometimes heard people talking about amazing one-man (and it usually is a man) shows performing Mark's Gospel. I am currently working on a presentation about Mark's Gospel in the digital age for the SBL International and I began to wonder if there were any great one-person presentations of Mark's Gospel on Youtube. And there are a few. They vary greatly in quality and degree of irritation and some, it has to be said, are a little acTORish, but here are a few that I have found interesting. It is indexed on Youtube by chapter, and the above is the playlist linking all sixteen chapters. The translation appears to be the NIV, but with some of McLean's little edits. One of the advantages of this version is that it introduces nice maps on screen whenever necessary, and we get the odd sound effect. He introduces some humour into the performance in such a way that surprising pieces end up seeming amusing, which of course is one of the advantages of a live performance. I must admit that this one is really growing on me. There is more on its own website, Mark's Gospel on Stage with Max McLean. There are some interesting issues with live performances that may help us to think through the performance of texts in antiquity. For one thing, I was struck how in both Wehrlin's and McLean's performances, Mark's broken sentence at Mark 2.10 ("but in order that you may know that the Son of Man has authority on earth to forgive sins . . . ."), often said by Biblical scholars to be somewhat colloquial, works very well. Similarly, one has to make a judgement about the ending of Mark. In both performances, the actors also perform the longer ending. I suppose the Biblical scholars will all balk at this, so ingrained is it that Mark finishes at 16.8, but actually, the relatively unfamiliarity of Mark 16.9-20 gives each performance a strange freshness. There are other performances available on Youtube, some much less professional than these two, and there are clips of others. One that may be of interest is Whitney Shiner, who is an actual Biblical scholar, here filmed performing Mark 7. This is not a professional video, but it gives an idea of his performance including, once again, the use of humour. It looks like he is in the classroom, but there is no further information about the performance here. I once heard Shiner performing pieces of Mark 15 at the SBL Annual Meeting. I am curious as to whether he has ever done a performance of the whole thing. Update (12.45pm): More! Thanks to Matthew Montonini for drawing my attention to several clips of Tom Boomershine performing Mark, all the more interesting since he is my respondent at the SBL International Meeting at St Andrews. Perhaps I could ask him to perform a piece for me at the session! For these, see also Mark 1.9-15, Mark 2.1-14, Mark 8.13-21 and Mark 10.1-12. Judging from the number of views these clips have had (in the teens for some of them), very few people know about this resource. In some ways it is not surprising given the lack of metadata for each video -- you'd have to know to search for Boomershine. Searches on things like "Mark as story" or "performances of Mark" or "Mark one man show" and so on would not turn these up. Perhaps this blog post can go some way towards changing that. Update (1.46pm): Thanks to three minute theologian (comments) who reminded me of Alex McCowen's famous performance of Mark's Gospel. There are some low-quality mp4s of the performance on Youtube. You can listen online on get the podcast. It's nice to see the NT Gateway featuring on its recommended reading list too. Princeton, NJ, June 12, 2013–Princeton Theological Seminary is pleased to announce the appointment of Dr. Dale C. Allison Jr. as the Richard J. Dearborn Professor of New Testament Studies, effective July 1, 2013. Allison joins the faculty in the Department of Biblical Studies. More at the link above. Great news for PTS. At this year's International SBL, I am participating in the Gospel of Mark section along with Thomas Boomershine, Eve-Marie Becker, Jeremy Punt and Elizabeth Struthers-Malbon. The theme of the session is "Communication, Pedagogy, and the Gospel of Mark". My contribution is a discussion of "Blogs, Pods, Websites and Mark: How the Internet Affects the Teaching of Mark's Gospel" and I am working on my paper at the moment. Since my paper focuses on the roles played by the internet and the blogs in the teaching of Mark, I would love to get some input from the blogging community on this one. My problem is that I am fine talking about the generalities, and I have a good general sweep through. However, when it comes down to using good, precise examples, I realize how few actual blog posts I can remember. I can remember most of my own, but I really don't want this paper to be about me! So I would like to ask my fellow bloggers if they have any ideas on this topic and, in particular, if they have any specific blog posts and series of posts that they think impact on this topic of teaching, researching and communicating Mark via the internet. Many thanks in advance. If you blog about this, please could you add a comment below too so that I don't miss anything good? Thanks. Teaching Mark's Gospel in the internet age presents multiple challenges and opportunities. The difficulty for most instructors is that they are digital immigrants, trained to access Mark in linear fashion in printed Greek New Testaments, Synopses of the Gospels and Biblical Translations, while their students are all digital natives, whose first access to the text may be via phone, tablet and laptop, with many navigational possibilities and different layers. So too with so-called secondary literature, the contemporary student is as likely to access Youtube, iTunes U and the blogosphere as they are the dusty articles and dated monographs that we love. But to embrace the new opportunities provided by the internet encourages instructors to rethink their approach to Mark in several ways: (1) The informal, often colloquial nature of blog posts can make the scholarship far more accessible to students, as well as encouraging them to try their hand at blogging about Mark themselves; (2) Podcasts make access to scholarship for blind and visually impaired students more straightforward and they enable all students to study away from the desk; (3) Websites that use dynamic ways of representing the Gospels and Gospel scholarship open up new avenues for both instructors and their students. Examples (good and bad) of the these phenomena in the teaching of Mark illustrate how to get the best out of digital Mark and digital Marcan scholarship. One of the neglected advantages of television documentary is its potential to act as archive, a resource for scholars. On this blog I have often talked about documentaries likes a Jesus: The Evidence (Channel 4, 1984), which provides footage of many great and now deceased scholars, including Geza Vermes and Morton Smith. In a recent article, I talked about how the Channel 4 series The Gnostics (1987) provides our only known extant footage of Mohammad 'Ali al Samman, the alleged discoverer of the Nag Hammadi codices. Along similar lines, I have recently begun thinking about the potential of the BBC documentary from 1977 entitled Who Was Jesus? to inform us about New Testament scholars and scholarship of its day. The difficulty, however, was in tracking down a copy. The book based on the series, also published in 1977, is fairly easy to track down on the second-hand book market and I picked mine up for about £4.00 a couple of weeks ago (and it has "35p" pencilled into the inside cover). The book is co-authored by Peter Armstrong and Don Cupitt and it is published by the BBC. I think my parents had a copy of this book too since it looks very familiar to me. I am also pretty sure that my mum (who was an RE teacher) made an audio recording of the series because I have some memories of having listened to it back in the day. And I recall hearing John Fenton's voice, something that I now find confirmed by looking at the list of consultants, about more of which in a minute. The book itself is an excellent, popular level introduction to historical Jesus study, clear, well-written, nicely illustrated and surprisingly contemporary in feel. 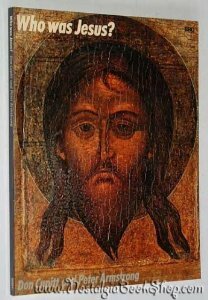 In fact, those who think that the study of the historical Jesus has made significant progress in recent years would be well-advised to take a look at this book written 36 years ago, with chapters on "the Jewishness of Jesus" and discussions of Jesus' apocalyptic, eschatological message, and stress placed on the Temple incident. And those who think that interest in the idea that Jesus never existed is new will be surprised to find the book opening with a study of the question, "Did Jesus Live?" Information on the documentary itself is less easy to come by, but according to the BFI website, it was two hours long and it was presented by Don Cupitt and produced by Peter Armstrong. There is an impressive list of consultants: John Fenton, Nahman Avigad, L. Y. Rahmani, George Caird, Christopher Butler and Sydney Carter. Given John Fenton's listing as a consultant, I am really hoping that my memory of his appearance is accurate and that I will get to see my former teacher on film. Anyway, this post is of course brought on by Peter Armstrong's released yesterday of a fascinating eighteen minute clip of the programme (Caird, Flusser and Cupitt on Who Was Jesus?). Dare we hope for more? Labels: TV documentaries, Who Was Jesus? There are so many features of interest here to those interested in the history of New Testament scholarship and TV documentaries. I had never seen David Flusser on film before, so that itself is a fascinating experience. And although I recently saw George Caird on film for the first time, in the Mansfield College video produced by the same Peter Armstrong, here one experiences another side of the man, somewhat more relaxed and frequently smiling. His comments about Jesus not expecting the end of the world and instead expecting the end of Israel's world very much prepares the way for his student N. T. Wright. The style of documentary is also fascinating. On the evidence of this segment, audiences 36 years ago were more patient than they are now. It is much less sound-bitey, more conversational and as a result -- I would say -- more engaging than many a modern documentary. The piece really does not speak down to its audience, and even tackles the possibility of Aramaic sources behind Luke's Gospel using graphics that still look nice decades later. And it's a reminder that Don Cupitt himself really was the master of this kind of documentary. He cuts a younger and more dashing figure than I recall from the 1980s, and he has an inquisitive, non-patronising means of delivery. I can't wait to see more of this documentary. Many thanks to Peter Armstrong for making this section available, and thanks to Matthew Montonini for spotting it and blogging it. Labels: David Flusser, George B. Caird, Peter Armstrong, TV documentaries, Who Was Jesus? It's also available as a PDF here. I am really grateful to Tucker Ferda both for the kind things he says about the book and also for the astute critique, to which I will give some thought. Hey, is that my book I can see just behind his left ear? !